"I thought I would write a quick note to let you know that our 'violation team' captained by David did a great job. As always I trust your guys, so the whole process was fairly painless. Thanks!" Give Your Porch a New Look. Written by Brook Reilly. June 28, 2015. When you go for your evening walk, you see more and more people in your neighborhood enjoying their day on their porch. The weather is nice, so why not end the day relaxing on your porch? A porch creates a whole new look to your house. When your porch is clean and organized, it makes your house look clean and organized too. Knowing this, you should declutter your porch to reflect nicely on your home. Sometimes decluttering alone is not enough. If the paint is chipping, the floor looks dull, or the railing needs a little repair, we can give you a porch with a brand new look. Add a flower box, paint the porch floor different colors, or put some hanging baskets up. These are just a few ideas you can do. We have to pay extra attention to how our porch looks because the porch reflect how our home looks. 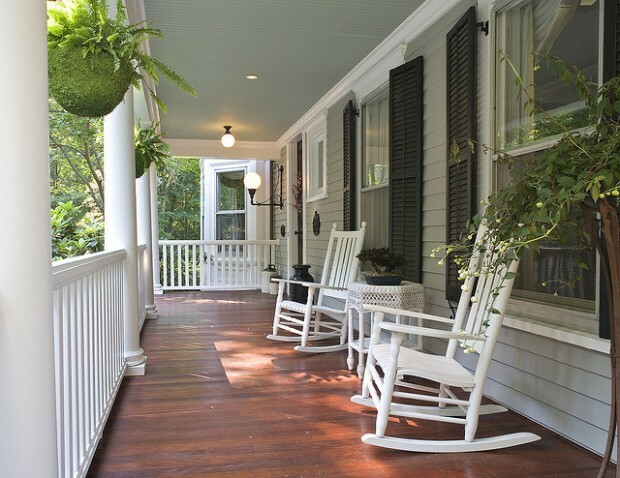 The ideas to give your porch a new look shouldn’t overwhelm you. Take it one step at a time. Figure out what needs your immediate attention and start there. Just change the simple things first, like putting up hanging baskets or rearranging the furniture and decorations. Look at the big picture and you will know what has to be done. Get some ideas from your neighbors and add your own style to make it your unique. Our company is ready to help you like we have helped so many of our customers in the past. Discuss your plan with our experts. Reach your goal with our help. Pretty soon you will enjoy your summer evenings on your new creation. There is no other way to end your day than to just relax on your beautiful porch. Give us a call, we are here to help whenever you are ready. Filed under: De-clutter Your Home, Gardening & Landscaping, Painting & Remodeling.